Each month, Revolutionary Paideia selects one person who embodies the “unsettling, unnerving, and unhousing” spirit that founded this blog. In life, we all make mistakes and we will always make mistakes as long as we live. When we make mistakes, we have to learn from them and recover from those mistakes better than ever. 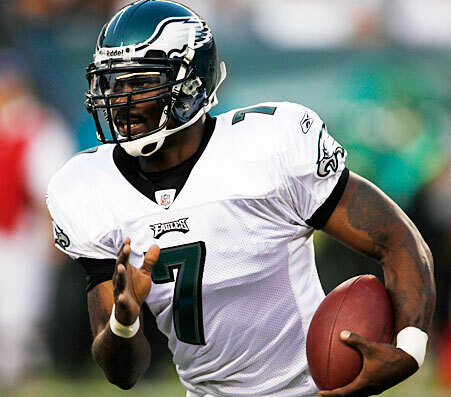 Michael Vick, the former quarterback of the Atlanta Falcons and current quarterback of the Philadelphia Eagles, has learned from his mistakes and has a truly powerful comeback success story. Michael Vick went to prison and served his time for dog fighting. Since he has been released from prison for dog fighting, he has worked with animal rights groups and has educated young children about the importance of treating animals properly, drawing from the lessons of his own experiences. Michael Vick has not allowed his past mistakes to keep him from being a successful quarterback in the National Football League (NFL). Although the NFL will probably award the Most Valuable Player (MVP) award to Tom Brady, the quarterback of the New England Patriots, because he has a better team record, what Michael Vick has been able to accomplish is certainly more impressive than what Brady has done. Michael Vick is the most exciting player in the league and makes people, even those who are not Eagles fans, want to see him play. For those who questioned whether Michael Vick could ever be a good pocket-passer, he has surpassed those expectations. Vick is making all of his haters look stupid. For those who refuse to give Michael Vick a chance to redeem himself, I find people like you to be simply ignorant. What if people never gave you a chance to redeem yourself after the many mistakes you have made? I bet you would be very unhappy about that. I am tremendously proud of what Michael Vick has been able to accomplish this year. He has had to combat great criticism and pressures, but this negativity has not stopped Vick from being the most electrifying player in the NFL. Vick serves an example for all people who have made serious mistakes that you can come back better than ever from those mistakes if you would only give yourself the chance. Some people want Vick to crawl into a hole and never come back, but I’m glad that he has enough inner strength to not succumb to their hateful desires. Although I have forgiven the Atlanta Falcons and Arthur Blank, owner of the Atlanta Falcons, for how unjustly they treated Michael Vick, I refuse to ever support the Falcons. I know that being from Georgia I should support the Falcons but I cannot bring myself to support an organization that exploited a man like Vick when the going got tough. The organization simply threw him under the bus. I cheer against the Falcons in every game that they play. I do this in honor of Michael Vick. I was so happy to see the Falcons lose at home against the New Orleans Saints on Monday night. I know Vick had to smile wherever he was when the Falcons lost to the Saints (#WhoDat). It is my pleasure to name Michael Vick The Revolutionary Paideia December 2010 Person of the Month. Revolutionary Paideia encourages Vick to continue to achieve at the highest level even in the face of great hate. This is an excellent choice. I think Mike Vick has done so much for the Eagles since he’s been there. It’s good to see how leadership effects a team. He was very humble over the past years after what happened. It’s great to see everything working out for someone who didn’t give up. Sad he still has to prove himself. Now to whom, I’m not sure but I know someone doesn’t believe in him. Thanks, Drew! People have to learn how to forgive. When a person has paid for his or her mistakes, that should be the end of the consequences of his or her mistakes. This man has learned from his mistakes and he is showing us all how you come back from making serious mistakes.